AMCAT Data Structure Questions: Computer Programming module is especially covered for Engineering candidates. It includes Arrays, Linked Lists, Trees, Graphs,Stacks and Queues, Hash Tables, Heaps, Searching and Sorting. 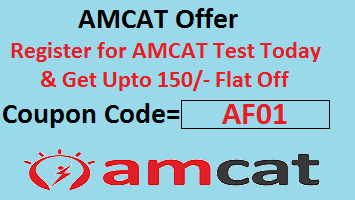 Below we will be covering in detail sample of AMCAT Searching and Sorting Questions. AMCAT Computer Programming is more important for job profiles like Technical Support Executive, Computer Engineer, Software Developer Web, System s/w, Product, Trainee, Testing Engineer, Research Engineer, Content Developer-IT, IT Recruiter, etc. Also 2- 3 questions come from Searching and Sorting topic each time. The difficulty level of the questions is, rather moderate. It takes probably, 1.5- 2 minutes to solve the problems. Sorting is nothing but storage of data in sorted order, it can be in either ascending or descending order. Hence, the term Sorting comes into picture with the term Searching. There are probably so many things in our real life that we need to search, like a particular record in database, roll numbers in merit list, a particular telephone number, any particular page in a book etc. Here Student roll no. can be taken as key for sorting the records in either ascending or descending order. Furthermore, suppose we have to search a Student with roll no. 15, we don’t need to search the complete record, rather we will simply search between the Students with roll no. 10 to 20. Since there are many techniques for sorting, hence implementation of particular sorting technique depends upon situation. Sorting techniques especially depends on two parameters. First parameter is the execution time of program, which means time taken for execution of program. Another is the space, which means space taken by the program. There are many types of Sorting techniques, differentiated mostly by their efficiency and space requirements. Following are some sorting techniques which are most noteworthy, especially for searching. What is recurrence for worst case of QuickSort and what is the time complexity in Worst case? Which of the following Sorting Algorithm will perform the worst if the numbers are ordered in the opposite form? Which of the following is not a stable sorting algorithm in its typical implementation. Binary Search can have _____ number of maxm comparsions? Which of the following sorting algorithms in its typical implementation gives best performance when applied on an array which is sorted or almost sorted (maximum 1 or two elements are misplaced). Explanation: Insertion sort takes linear time when input array is sorted or almost sorted (maximum 1 or 2 elements are misplaced). All other sorting algorithms mentioned above will take more than linear time in their typical implementation. 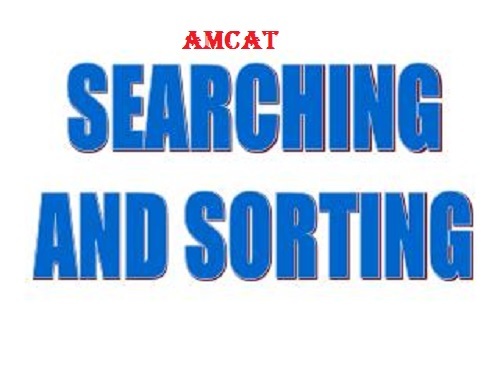 Any confusion on AMCAT Searching and Sorting Questions 2018, please comment. What is the third number from the left while doing bubble sort in the 3rd iteration for 5 1 4 2 8? know if it is completed. The algorithm needs one whole pass without any swap to know it is sorted. Consider a situation where swap operation is very costly. Which of the following sorting algorithms should be preferred so that the number of swap operations are minimized in general? Explanation: Selection sort makes O(n) swaps which is minimum among all sorting algorithms mentioned above. Which of the following is not true about comparison based sorting algorithms?